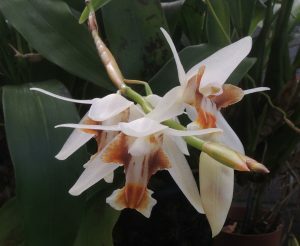 This unusual Coelogyne species has a wonderful habit of flowering for several years from each flower spike, a habit it shares with a small number of other species from section prolifera. Our large plant is about to be split after flowering and so we will be able to offer these for sale again next year. After flowering the flower spikes take a ten month rest before extending again for the next year’s flowers. The longest we have had is four years of flowering from one stem. We have seen this species in forest above Gangtok in Sikkim where it grows in cool, wet, evergreen, monsoon forest on mossy trunks and branches. To match this habitat we grow the species in our Cool Asia section (minimum 10C) and keep it well watered throughout the year and remember not to cut off the flower spikes.